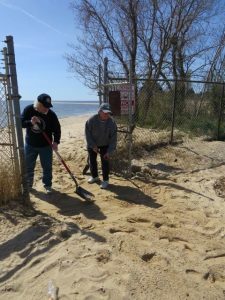 Workday: Calvert Marine Museum – April 21, 2018 – Chesapeake Chapter U.S.L.H.S. Work crew L-R Carolyn, Anne, Tony, Trez, Lauren, Paula, Kevin, Sue and Gerry. We had a nice size work crew for our first preservation event of 2018. I was a little more worried than usual this time because it has been hard to tell what the weather will be on any given day this year – and a lot of the work we wanted to do was outdoors. So we were very pleased when the weather turned out to be near perfect for us down at Calvert Marine Museum’s Cove Point Lighthouse. 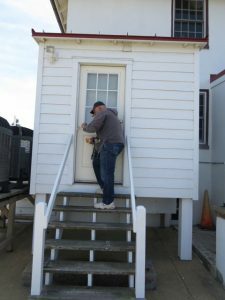 We met with Educator Kevin Allor at the Cove Point light station down in Lusby Maryland. Once most of us had arrived he took us around showing us what the work for the day would be and explained each of the tasks on our list. He already had all the supplies laid out and ready for us to begin. It was well organized as is usual for the crew down at Calvert. Having received our instructions we collected our supplies and dispersed around the station. 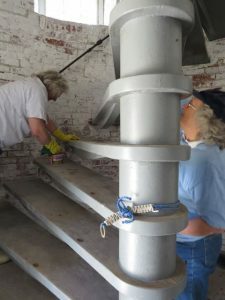 The work was mostly around the thirty-six foot tower built in 1828, where we could see as we approached the area in need of a little TLC. Some of the stucco had been knocked off around the door. That area was scraped so all the loose material was removed and then the stucco was replaced. While that was being done the tower steps were swept clear of accumulated sand from top to bottom and then the base was swept clear. It took about two cycles of sweeping before the battle with the accumulated sand was won. After the stairs were cleared the crew used a diluted bleach solution to clean the mold and mildew off the bottoms of the stairs and the center column. This seems to be needed every couple of years. Everyone watches a Tony puts the final touches on the lock. 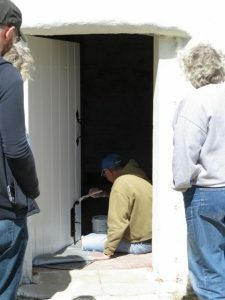 The door was scraped and painted with bright white paint and then the metal door handle and lock mechanism was given a coat of glossy black Rust-Oleum. It looked really good when finished. The gate to the beach was buried in sand so that was cleared so you could actually swing the gate open. When we were done we were told it had been quite a while since the gate was cleared that well. You could swing it open in both directions and we made sure the sand sloped gently down to the gate. It looked quite good – if I do say so myself! 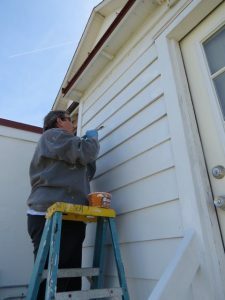 We also touched up the paint on the exterior sections of the keeper’s house where some caulk had been applied to the nails. It was a busy day – but we finished up around 3:30 and headed home. We had clear skies and temperatures in the 50s and supposedly approaching 60, though I’m not sure it ever actually got there. It was nice to be outside on such a day and to be next to the bay with good friends doing lighthouse work was an added treat. Lighthouse in need of TLC. Trez prepares to patch. Trez puts final touch on the patching. 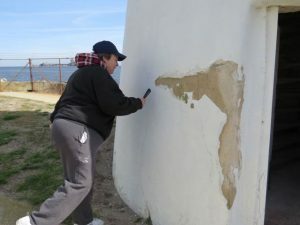 Carolyn touches up paint job on Keeper’s house. 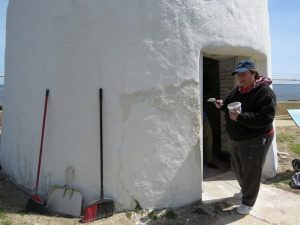 Gerry touching up paint on keeper’s house.